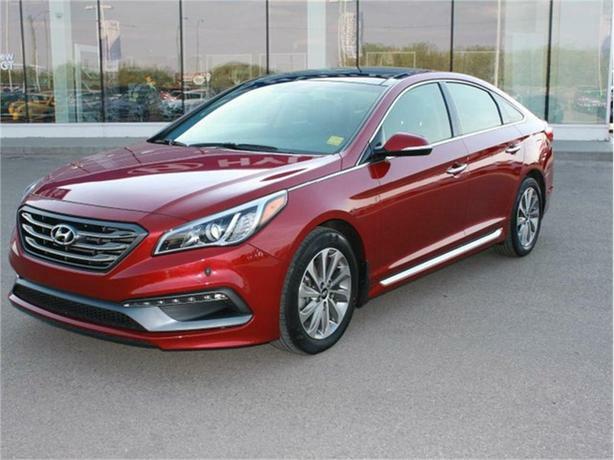 This shining example of a Sonata is loaded with all your favourite tech options for ultimate comfort. With a clean damage history, and remaining factory warranty on this low mileage specimen, you will have no worries for years to come while driving this vehicle. Our service technicians have given this Sonata a multi point vehicle inspection, requiring oil and filter changes and a 4 wheel alignment, and nothing more. You can be rest assured at the reliability of this sleek car. Some favorite options include the panoramic sunroof, heated seats both front and back, and a fully heated leather wrapped steering wheel. Also included are a large touch screen entertainment system, with navigation, wide angle backup camera, and selectable drive modes for optimal performance. You will not be disappointed.